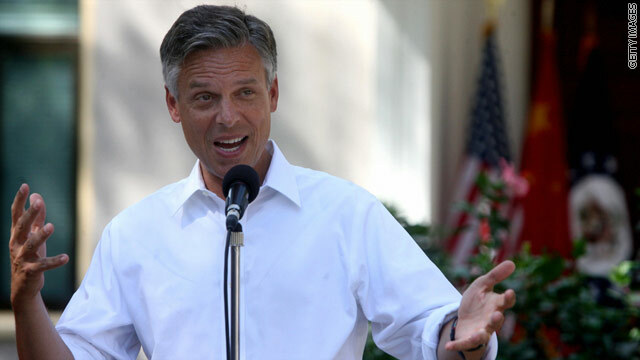 Washington (CNN) – The campaign manager for Republican presidential candidate Jon Huntsman resigned Thursday, the Huntsman campaign confirmed to CNN. Susie Wiles will be replaced by communications director Matt David, according to a statement. The former Utah governor will announce the changes to his staff Thursday. "Susie has served the campaign well and was vital in getting it off the ground in such a short time-frame," Senior Campaign Adviser John Weaver said in a statement. "Now the campaign is moving into phase two which will be more aggressive from a messaging and tactical standpoint and Matt is prepared to take that on." News of the resignation was first reported by The Washington Post. it's too bad, Huntsman is the ONLY person the Repubs have this year who would do a remotely good job. I wish all republicans would quit...they are ALL a curse on the working class/middle class (If there is still a middle class out there), and the poor. This guy is the only Republicans with functional brains!! sober minded, thoughtful and politically he doesn't stink like the rest in the field. SO Rick Perry of Texas is slithering away from that wacky extreme right-wing overly religious guy who has an upcoming forum that Rick Perry is supposed to speak at? All of a sudden th elinks are gone on Rick Perry's web-site and his people are saying that he may not even speak at the forum after all? I'll bet you'll never ever hear any of these things mentioned on FAUX channel! You don't get much there. They try to keep their viewers in their little bubble. FOLKS! These are just a few of the topics discussed on my favorite cable show, Rachel Maddow Show. Smart, funny & informative. Give it try! It does make one wonder. I would that Huntsman can get someone who ccould set up the other states as well as the woman who left if Huntsman does well in Iowa and New Hampshire. There seem to be personnel issues with all of the candidates. Is it the candidate or is it the staff leaders? Something is amill. I hope Huntsman figures it out. He needs to get his name out to bring needed fundraising revenue. I voted for Obama but no longer have faith in him and every other republican in the line up is standard republican evil. Huntsman seems to have heart and character. At this point, I'd vote for him. Does Huntsman have more wives than Romney? Allen West and the wingnuts are unhinged. Huntsman is too nice for them. Snookie Palin wants Bachmann's money and media attention. She is a perfect fit. Maybe he went to work for Mr. 9/11 (we were never attacked under the shrub administration) or maybe he went over to mr bad hair man who is now thinking of running as an independent because I take it that declaring bankruptcy over and over again makes you a good businessman and economist! Leaving like rats jumping off the Titanic!!! Huntsman is the only realistic shot the republicans have against Obama, and even then the odds aren't good. His positives appeal to independents, and he displays the intelligence and temperment the job requires. These features also make him completely anathema to the wild-eyed pitchfork types of the TP. 2016 could be his year, or 2020, if it takes that long for the TP to implode. Huntsman is the only Republican I could vote for. He's a more conservative version of President Obama. The rest of them are crazier than s- house rats.